Replaced our cracked and leaking terracotta pot this morning with a new stone fountain. It weighs a lot—took three of us to get the base into the car and the shell at the top weighs about 15kg. The main work was wiring the pump, so that it went through the base of the water dish, and rather than go back to the junction box and rewire that, I bought an underwater connector and connected the pump inside the dish. It worked pretty well. Getting the water from the pump to the shell was okay once the PVC tubing had been boiled for a few minutes. I’ve got a bit of tweaking to do now to increase the flow—in the summer. The fish have lost out. The previous pot was much larger and they’re now down to a few inches of water and swimming round and round in circles. I think they better go to a friend’s pond before the summer. I can see this whole thing drying out if left for a few days. Raced through Monkey, or better known as Journey to the West. Motivated by memories of the amazing BBC series in the ’70s (mind you the picture below doesn’t quite live up to those memories—what a sad looking bunch). The book is a great page turned, full of humour and a straightforward plot. A good understanding of Taoism and Buddhism would have helped my understanding. The tale as a whole made sense—never got a feel for that from the TV series. Also, the Heavenly Peach Banquet was fantastic. Michael managed to get off work a little early yesterday so that we could go to see Pelléas et Mélisande, an opera by Claude Debussy, adapted from a play by Maurice Maeterlinck. Cambridge University Opera Society put on the production at West Road Concert Hall, so we started the night with a nice stroll to get there. The score by Debussy was beautiful, and beautifully played too. It’s not a heavy score, and is minimal in places. Haunting music in parts. Fiona Mackay was great as Genevieve, and it was a pity she wasn’t on stage more—she has a marvellous voice. Christopher Law and Louise Kemey were also great, and we thought that Louise Kemey should have come in as the lead for the ovation, as she stood out and had to do a lot of work, being in every scene. The second half was more dynamic than the first, with the great meeting of the leads outside the fort walls, and the stabbing of Pelléas. I really enjoyed this production—it was a great example of how the vision and production can make for a singular experience. I can easily imagine this opera performed as a very rich, and encompassing style. Pelléas et Mélisande is a gem of Symbolist opera, what Olivier Messiaen called ‘one of the great, quite exceptional masterpieces of opera’ (1979). Maeterlinck’s characters are guided through fate’s path as marionettes. Death hangs constantly over the characters with absolute inevitability. Death as it occurs is purely symbolic, as none of the characters were ever alive, in accordance with Maeterlinck’s belief that ‘poems die when living people get into them’. 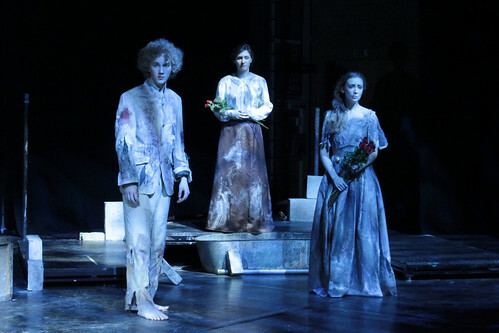 The souls which wander the stage in Pelléas et Mélisande are merely symbols of humanity. All we see is a single moment, a visible flash of an infinite cycle of life. The characters reveal infinite truths which will recur along with the continuation of mankind – lies, murder for jealousy, possession within love, innocence, and corruption. Maeterlinck’s Pelléas et Mélisande was first performed in Paris in 1893. The play was seen by Debussy, who sought permission from Maeterlinck to write the opera, which was granted. Although completed in 1895, the work was not performed until 1902, when it was staged in the Opéra-Comique theatre in Paris. The scenes take place during the Middle Ages in the fictional kingdom of Allemonde. Prince Golaud, grandson of Arkel the King of Allemonde, finds a mysterious young woman, Mélisande, lost in a forest. He marries her and brings her back to the castle of King Arkel. Here Mélisande meets Golaud’s younger half-brother Pelléas and they become friends. Golaud surprises Pelléas caressing Mélisande’s long hair, but initially dismisses the incident as child-like play. Later, Golaud attempts to discover the truth about Pelléas and Mélisande’s relationship by forcing his son, Yniold, to spy on the couple. Pelléas decides to leave the castle but arranges to meet Mélisande one last time and the two finally confess their love for one another. Golaud, who has been eavesdropping, rushes out and kills Pelléas. Mélisande dies shortly after, having given birth to a daughter, with Golaud still begging her to tell him “the truth”. On Tuesday night I saw a good production of The Invention of Love by Tom Stoppard at the ADC. Good review in the TAB. Oskar McCarthy (Young Houseman) put in a great performance, and was well supported. A.E. Housman, renowned poet and classical scholar is dead. As he is ferried across the river Styx he reflects upon his life. We first see the young Housman in a punt in 1870s Oxford. Then later we see his life in London in the 1890s, when the chattering classes are all talking about Oscar Wilde. As the young Housman longs after his unrequited love, and finds his poetic voice, everything else is changing around him. Wilde asks Housman, “where were you when all of this was happening?” and Housman replies, “at home”. The play asks us whether life should be lived cool and detached, or hot and exciting. The play explores the nature of art, scholarship, and of course love. This is Stoppard at his best. His language is beautiful and his wit is sharp. This year the East Coast Winter Warmer for the Sailing and Cruising Association was held in Cambridge, on Valentines Day. We had close to 30 people for the lunch, which was good, and this was in La Mimosa which did a good value lunch for us—three courses for £15. The mussels were popular and nice (albeit there could have been a few more on the plate) and the beef and fishcakes were tasty too. We avoided speeches even though Reggie was under repeated pressure. Afterwards about 13 of us headed off for some punting down the backs—we got a great deal in the end from Scudamores: the CamCard rate of £14 a punt, and they forgot to charge me (at least) for the blankets and cushions that were £5 extra (and I forgot until I was writing this!) The river was freezing and so after I punted us five of us upstream to the Mill Pond, I was left with completely with numb hands. Deepak got the hang of punting on the way back and after an impressive reverse punt and turn through Silver Street Bridge. Barry was a fast punter and got us back at good speed. Bob had made some fantastic mulled wine for this, which kept us going there and back and made us the envy of many passing punts. We all met up back in the Pickerel Inn for a few beers afterward the punting (and met up with those that hadn’t gone punting at all). Much drinking followed and bit by bit people left, until we were down to the final seven (from Ipswich) who headed back to the train station to get the 19:12 train. Silent Canonfire by Will Seaward. Had to go to this one when I read the description below! It was a 45 min silent production, accompanied by great fiddling in a sea shanty style. Good, fun, expressive theatre, in the tiny studio at the ADC. The man playing the naval officer (in the green frock coat) was very good—expressive face, and got a lot of laughs. The pirate captain was also funny. Good scenes in the Brothel, when three of the loose women hitched up their skirts, bent over and ‘BROTHEL’ was written across their backsides. Another good scene where two pirates are made to walk the plank, and end up marooned on a desert island: they start seducing each other and all the dialogue was written on their clothing as they stripped! It takes guts to put on this sort of production! Three pints of beer in advance would have aided my appreciation considerably. A COMPLETELY SILENT swashbuckling PIRATICAL ADVENTURE, live! Never has such a thing been attempted by humankind! Based on the lives real, actual pirates, brimming with the eerie creaking of silent boards, the deafening howl of silent gales, the jingle of silent treasure, the roar of silent explosions, the cries of silent maidens, the singing of silent mermaids, silent canonfire, uproarious silent drinking songs, silent bravado, silent love, silent rivalry, silent swordplay, silent dead people, silent hats, silent weevils, silent facial hair and the clamour of silent battles, this absolutely unique, mighty, rollicking, dangerously exciting, once in a lifetime piece of insane theatrical daring from the director of ‘Bouncy Castle Hamlet’ (“triumphant success” The Guardian, “genius” Metro) is coming to the Larkum Studio from 10th to the 13th of February! It’s not a joke! It’s a real, live, corporeal, tangible experience (and an exciting experiment in pure semiotics to boot)! Huzzah! Just back from a great production of The Crucible by Cambridge University Amateur Dramatic Club. Apparently it had already sold out last week, and I’m not surprised. Star of the show was James Walker, who was fantastic and very strong as John Proctor (he also played a great wicked baddie Nalu in Ali Baba the Panto). The rest of the cast were also good: Ben Khavanagh did well with the role of Dr Parris, and Eve Hedderwick Turner as Mary Warren, and she also looked fantastic in the part. Phoebe Haines was an excellent, seductive Abigail Williams. Tom Oven was entertaining and convincing in the part of the old Giles Corey—which was an achievement. The stage was pretty bare, used full depth. The cast of 18 sat on hard-backed chairs in a row on the left and right of the stage. I found this a bit distracting at the start, but soon forgot about, and it worked well given how often the cast had to pop on and off the stage. The simple setting suited the powerful and shocking script, delivered well by the cast. It is 1692 in Salem, and there’s magic in the air. Religious fervour and sexual repression come into explosive conflict as accusations of witchcraft spread through the town like fire, fuelled by paranoia and hatred. John Proctor finds himself trapped in a web of deceit and suspicion as his past sins come back to haunt him, and the hysterical youth of Salem lead a crusade against the forces of the devil. In ‘The Crucible’, one of the greatest plays of the 20th century, Arthur Miller brilliantly weaves together the damaged world of Proctor and his wife with the madness sweeping through the town, creating a profoundly moving theatrical experience which audiences will find utterly unforgettable. This production will take place in a shadowy world of judgment and fear, imprisoning the audience in an atmosphere of rising tension up until the play’s harrowing conclusion.